Detangling isn’t always an easy task no matter your hair type. Impatience and mishandling can lead to a variety of set back issues such as hair breakage, split ends, mid-shaft splits and/or fairy knots. The preferred method for detangling are the fingers especially in the natural hair community but not everyone likes doing that. Bone combs are not made out of actual bone but organic resins, which mimics the qualities of bone. They are created via a labor-intensive process where the materials are hand carved, sawed and polished. Bone combs are anti-static and heat-resistant. Bone combs can last for an entire lifetime. Seriously! I’ve had mine for years. The wide teeth make bone combs one of the perfect tools for detangling. Bone combs don’t snag on ends or rip the hair out, thanks to the extra smooth ends, which only gets more effective over time. Bone combs are seamless and help guard against split ends. There are some manufacturers who pass off brown plastic combs as bone combs but it’s easy to identify by the price as well as recognizable seams in the comb. Real bone combs aren’t cheap but if you care about the health of your hair, in the long run, adding a bone comb to your stash is highly recommended. They come in various sizes but I use two – the giant rake for detangling and the wide-toothed medium rake during Curlformers sets after detangling with the big one first. I also use the smaller rake when I’m braiding my hair. My bone combs come from Hair Sense. Bone combs work for all hair types. As far as detangling tools go, I give bone combs 5/5. 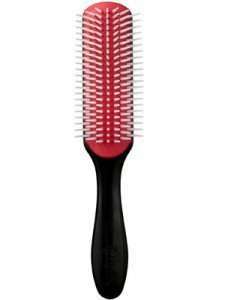 Though this brush was created for detangling pet hair, it works wonderfully on human hair as well. The flexible design of the Tangle Wrangler Detangler Brush allows it to separate and open up as you work the brush through your hair. It reduces shedding and breakage. It is also excellent for defining waves or curls while styling. The Tangle Wrangler Brush works best on wet hair in small sections. It is suitable for all hair types. I rate this brush 5/5. If you’re not familiar with Ouidad, they produce products for curly ladies. I have a few of their products in my stash. 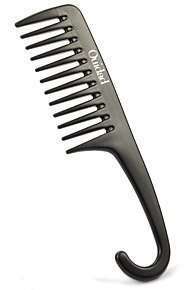 Their wide tooth comb is made of black plastic and has a nifty handle that you can hang on your shower rack. The ends of the teeth are rounded making it gentler on the hair. This comb, however, has very fine seams and should be used on hair dripping with conditioner in the shower. It works wonders under those circumstances. Ideally, it works best for type 1 – type 3C hair. If your hair type falls above this, a comb with wider teeth would probably work better. The comb comes with a love your curls starter kit on Ouidad website or you can buy it separately HERE. I rate this comb 4/5. Currently, Ouidad has another comb named the Double Detangler, which claims to reach through the “most dense” curly hair and has the right width for detangling knots. However, I haven’t tried this yet so will not review it in this article. Denman produces over 20 types of brushes but the one most commonly used for detangling is the D3 Classic Brush. 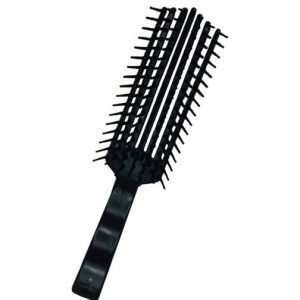 It’s a medium-sized styling brush with 7 rows of nylon pins. The rubber pad provides maximum grip while in use. The great thing about the D3 Classic Brush is it can work out even the tightest knots and if you find the rows too much for your hair, you can modify them by removing 2 – 3 rows without reducing the effectiveness of the brush. This brush should be used to detangle only while you have a lot of conditioner in your hair and should be used with patience. If you’re in a hurry, it can rip out your hair. Personally, I recommend it for type 1 – type 4a hair types only unless you’re using it to create finger coils. Hair types above this might have issues with it. I rate the D3 Classic 4/5. With an enticing name, the Tangle Teezer was designed to demolish knots and tangles. It comes in a compact size with bristles of various lengths. They also come in various funky colors. The Tangle Teezer doesn’t have a handle, which can make it difficult to hold onto while detangling hair. The bristles can also bend slightly over time rendering it ineffective and even unhealthy for your hair. 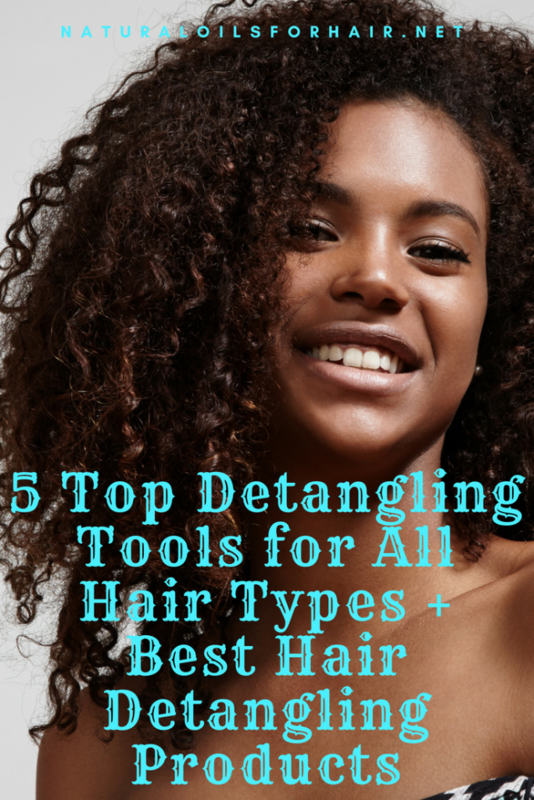 If you have hair in the type 3c – type 4 range, I strongly recommend trying another detangling tool. From personal experience with my 3c/4a hair, it can cause breakage and split ends. For type 1 – type 3b range, it should work wonders with minimal to no problems. 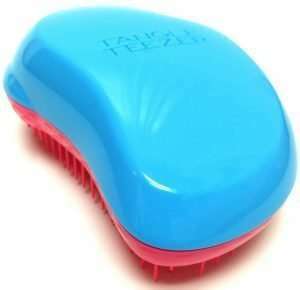 I rate the Tangle Teezer 3/5. You can also create your own detangling oil with the great recipe here – Ultimate Oil Mix for Detangling After Taking Down Extensions. Have you tried any of the above detangling tools for hair? Or some other type of detangling tool that you think is just as effective? Let us know in the comments section. I had not heard of bone combs before. The price is pretty good, seeing that they last for so long. Is the Leatherwood Detangler available at beauty supply stores? Bone combs last forever. I’ve had mine for nearly 6 years and they’ve gotten better over time. If you’re located in the US, you can buy the leatherwood detangler here – http://www.detanglebrush.com/order-the-brush.html. They unfortunately don’t ship outside US. A comb getting better over time is certainly something rare to hear. I want to try it, but I have a comb that works pretty well at the moment. I’ll probably get one when it breaks or gets lost. Thanks for the link. I have a friend who likes to try out different hair tools. She would probably be interested in it.